Cities: Capital: Podgorica. Other major cities — Bar, Berane, Bijelo Polje, Budva, Cetinje, Herceg Novi, Kotor, Niksic, Pljevlja, Tivat, Ulcinj. Terrain: Montenegro's terrain is varied. It includes mountainous regions with thick forests in the north; central plains; and a rocky Adriatic coast with very few islands. Nationality: Noun: Montenegrin(s); adjective — Montenegrin. Population growth rate (2010 EU Progress Report): 4.1%. Ethnic groups (2011 census): Montenegrin 44.98%, Serb 28.73%, Bosniak 8.65%, Albanian 4.91%, Muslim 3.31%, other (Croatian, Roma) 4.36%; 4.87% did not respond. 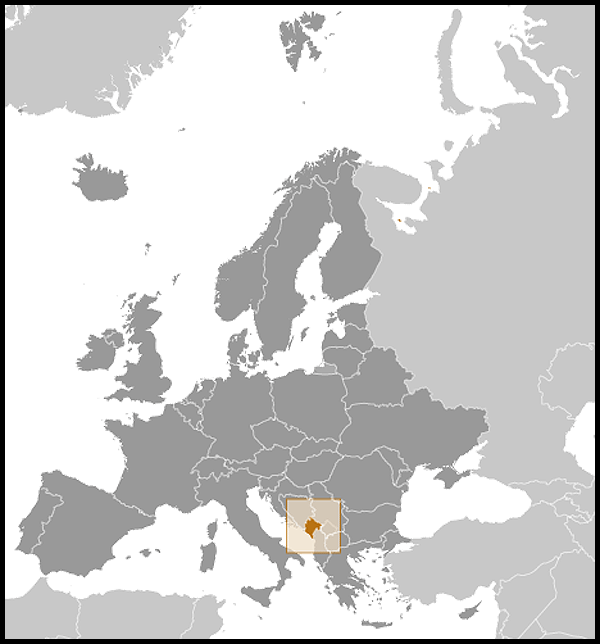 Languages: Serbian, Montenegrin, Albanian, Bosnian, Bosniak, Croatian, Roma. The October 2007 constitution established Montenegrin as the official language, and decreed that Serbian, Bosniak, Albanian, and Croatian also may be used officially. Health (2010 EU Progress Report): Infant mortality rate (2009 data) — 5.7 deaths/1,000. Life expectancy (2009 data) — male 71.7 years, female 76.6 years. Branches: Executive: president (chief of state); prime minister (head of government). Legislative — Montenegrin parliament. Judicial — Constitutional Court and Supreme Court. Political parties (in alphabetical order): Albanian Alternative (AA), Albanian Coalition "Perspective", Bosniak Democratic Party, Bosniak Party (BS), Croatian Civic Initiative (HGI), Democratic Center, Democratic League in Montenegro (DSCG), Democratic Party of Socialists (DPS), Democratic Party of Unity, Democratic Serbian Party (DSS), Democratic Union of Albanians (DUA), Democratic Union of Muslims-Bosniaks, FORCA, Green Party of Montenegro, Homeland Serbian Party, Liberal Party (LP), Montenegrin Communists, Movement for Change (PZP), New Serbian Democracy (NOVA), Party of Democratic Prosperity, Party of Pensioners and Invalids of Montenegro, Party of Serbian Radicals (SSR), Party of Serbian Unity (SSJ), People's Party of Montenegro (NS), People's Socialist Party (NSS), Rule of Law Party, Social Democratic Party (SDP), and Socialist People's Party (SNP). Administrative divisions (21 municipalities): Andrijevica, Bar, Berane, Bijelo Polje, Budva, Cetinje, Danilovgrad, Herceg Novi, Kolasin, Kotor, Mojkovac, Niksic, Plav, Pljevlja, Pluzine, Podgorica, Rozaje, Savnik, Tivat, Ulcinj, Zabljak. 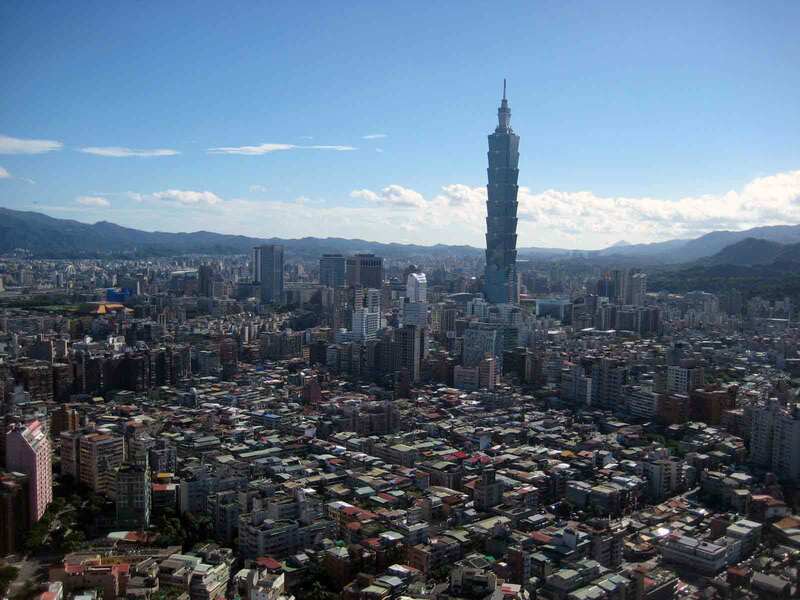 Trade (2010): Exports: $446.3 million (€330.3 million). Major markets — Serbia ($101.2 million; €74.9 million), Greece ($76.2 million; €56.4 million), and Italy ($65.9 million; €48.8 million). Imports — $2.235 billion (€1.654 billion). Major suppliers — Serbia ($584 million; €432.2 million), Bosnia and Herzegovina ($166.8 million; €123.5 million), and Germany ($157.9 million; €116.9 million). The origins of the Montenegrin state can be traced to the emergence of Duklja, a vassal state of Byzantium, in the 9th century. In 1042, King Vojislav won a decisive battle against Byzantium, and Duklja became independent. About 120 years later, Duklja (by then known as Zeta) was conquered by Raska (Serbia). The use of the name Montenegro began in the 15th century when the Crnojevi dynasty began to rule the principality of Zeta. Over the subsequent centuries, Montenegro, while a part of the Ottoman Empire, maintained a level of self-autonomy. From the 16th to 19th centuries Montenegro was a theocracy ruled by a series of bishop princes, who were at first selected by popular assembly but later through heredity. In 1852, it was transformed into a secular principality when Danilo Petrovic Njegos set aside the ecclesiastical title and assumed the title of prince. Montenegro was recognized as an independent, sovereign principality by the great powers of Europe assembled at the Congress of Berlin in July 1878. During World War I, Montenegro fought on the side of the Allies but was defeated and occupied by Austria. Upon Austrian occupation, King Nikola I and his government went into exile. In late 1918, an Assembly met in Podgorica, and under the eyes of the Serbian army, deposed King Nikola and declared unification with Serbia. The government of Montenegro in exile denounced the Assembly's action, to no avail. From 1919 to 1941, Montenegro was part of what became known as the Kingdom of Yugoslavia despite armed resistance in the early 1920s to rule from Belgrade. When Yugoslavia was invaded and partitioned by the Axis powers in April 1941, Montenegro was occupied by Italy and ran under a nominally autonomous administration. While some Montenegrins sided with Italy, motivated by antipathy against past rule from Belgrade, the Partisan Revolt in Montenegro began early, on July 13, 1941, and initially scored impressive successes against the Italian occupiers. Throughout World War II, Montenegro served as an effective base and refuge for Josip Broz Tito's partisans. After the war, Montenegro was granted the status of a republic within the Socialist Federal Republic of Yugoslavia. The breakup of the Yugoslav federation after 1989 left Montenegro in a precarious position. 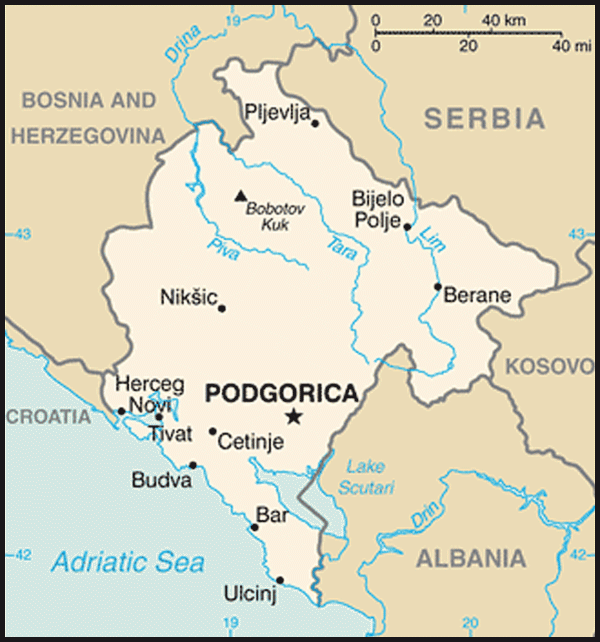 During 1991 and 1992, Slovenia, Croatia, Bosnia and Herzegovina, and Macedonia all seceded from Yugoslavia. In April 1992, Serbia and Montenegro jointly approved the Constitution of the Federal Republic of Yugoslavia (F.R.Y. ), and supported Yugoslav President Slobodan Milosevic's military campaigns in the early to mid-1990s. Despite Montenegro's political attachment to Serbia, Montenegro maintained a sense of national identity. The government of Montenegro was critical of Milosevic's 1998-99 campaign in Kosovo, and the ruling coalition parties boycotted the September 2000 federal elections, which led to the eventual removal of Milosevic's regime. In March 2002, the Belgrade Agreement was signed by the heads of the federal and republican governments, establishing the parameters for a redefinition of Montenegro's relationship with Serbia within a joint state. In February 2003, the F.R.Y. parliament ratified the Constitutional Charter, establishing a new state union and changing the name of the country from Yugoslavia to Serbia and Montenegro. On May 21, 2006, the Republic of Montenegro held a successful referendum on independence and formally declared independence on June 3, 2006. The first parliamentary elections following Montenegro's declaration of independence were held on September 10, 2006. Both domestic and international observers assessed the elections as being generally in line with international standards. Zeljko Sturanovic of the Democratic Party of Socialists (DPS) was appointed as Prime Minister. The newly elected Montenegrin parliament began work on the country's first post-independence constitution, which was adopted on October 19, 2007. The constitution, among other things, changed the country's official name to "Montenegro." Prime Minister Sturanovic resigned for health reasons in February 2008 and was succeeded by former Montenegrin President and Prime Minister Milo Djukanovic. Presidential elections were held on April 6, 2008, and incumbent President Vujanovic was elected for a second 5-year term with 52% of the vote. Domestic and international observers assessed this election as being generally in line with international standards. On June 10, 2009, a new parliament re-elected Prime Minister Djukanovic to a sixth term. Prime Minister Djukanovic resigned from office on December 21, 2010, while remaining President of the ruling DPS party. On December 29, 2010, the Montenegrin parliament approved President Vujanovic's nomination of Igor Luksic as the next Prime Minister. Luksic, also from the DPS, had been serving as Minister of Finance under Prime Minister Djukanovic since 2004. At 34 years of age, he became the youngest head of government in the world. European and Euro-Atlantic integration has been one of the driving forces behind the reform process that led to the signing of a Stabilization and Association Agreement (SAA) with the European Union (EU) in October 2007. On May 1, 2010, the SAA came into force after ratification by all 27 EU member states. On November 9, 2010, the European Commission recommended that Montenegro be approved as an EU candidate country, with the stipulation that accession negotiations begin after seven "key priorities" are addressed. That decision was ratified by the European Council, and EU candidate status was granted on December 17, 2010. Montenegro now awaits a confirmed date for the start of accession negotiations with the EU. Citizens overwhelmingly support EU membership, although the country faces continued challenges in its quest for Euro-Atlantic integration. The government also continues to pursue NATO membership and was invited in 2009 to participate in the Alliance's Membership Action Plan (MAP). Despite considerable progress since independence and success in maintaining inter-ethnic harmony, some ethnic tensions remain. The country must also cope with the significant challenges involved in strengthening the rule of law. Numerous international observers, non-governmental organizations (NGOs), think tanks, and media have reported on Montenegro's significant problems with organized crime and corruption, which are widely believed to be pervasive at all levels of society. In addition to these issues, there is a significant disparity in incomes between the rural, ex-industrial northern regions of Montenegro and the more prosperous central and coastal regions. In June 2010, the Department of State's Trafficking in Persons (TIP) annual report upgraded Montenegro from Tier 2 Watch List to Tier 2, citing the country's significant efforts in attempting to meet minimum standards for the elimination of trafficking. The 81-member parliament is Montenegro's lawmaking body. Members are elected in general elections. Following 2009 elections, the governing DPS/SDP/BS/HGI/DUA coalition had 48 seats in parliament, followed by the SNP (16 seats), NOVA (8), PZP (5), FORCA (1), Albanian List coalition (composed of the Democratic Alliance in Montenegro and the Albanian Alternative) (1), and the Albanian Coalition-Perspektiva (composed of Party of Democratic Unity of Albanians and a group of citizens represented by Amir Hollaj) (1). The Montenegrin Government has established a military and a Ministry of Defense. Further reform and transformation of both institutions is underway. The Montenegrin military operates under the joint authority of the Security and Defense Council, which consists of the president, prime minister, and the speaker of parliament. Parliament also maintains oversight through its Security and Defense Committee. Montenegro officially entered NATO's Partnership for Peace in November 2006, and in April 2008 was invited to join an Intensified Political Dialogue with the Alliance. On December 4, 2009, the NATO foreign ministers invited Montenegro to participate in the Alliance's Membership Action Plan (MAP). Montenegro submitted its first Annual National Program (ANP) in September 2010. Montenegro deployed an infantry unit to NATO's International Security Assistance Force (ISAF) in March 2010 and currently has 45 troops in Afghanistan. Montenegro has natural resources, primarily bauxite, adequate water supplies, and a climate conducive to agriculture and tourism. Prior to World War II, Montenegro's economy was principally agrarian. The establishment of the bauxite-alumina-aluminum industry after the war provided Montenegro with a core strategic industry while the existence of a unified Yugoslavia offered guaranteed markets and a wide pool of suppliers. In the 1960s, tourism began its initial growth, largely attracting visitors from Eastern Europe and Yugoslavia. War and sanctions in the early 1990s hit Montenegro hard, plunging many citizens below the poverty line, and significant recovery began only after the end of the Kosovo crisis in 1999. The adoption of the deutschmark (DM) in November 1999 largely disconnected Montenegro's economy from Serbia and from the extreme currency fluctuations experienced by the Serbian dinar. On March 31, 2002, Montenegro replaced the DM with the Euro, though it is not officially part of the European economic and monetary union (Eurozone). The recent global financial crisis had a significant negative impact on the economy, largely due to the ongoing credit crunch, a decline in the real estate sector, and a fall in aluminum exports. In March 2009, Moody's Investors Service downgraded Montenegro's government bond rating from Ba2 to Ba3 and assigned a negative outlook to the rating. On March 31, 2010, Standard & Poor's Ratings Services lowered Montenegro's long-term sovereign credit rating from 'BB+' to 'BB', while also affirming the short-term sovereign credit rating at 'B'. Reflecting a stabilizing financial climate, however, on March 30, 2011, Moody's upgraded its outlook on Montenegro's government bonds from negative to stable, though the Ba3 rating remains unchanged. Ba3 and BB rated securities are considered "non-investment grade, speculative" bonds. In September 2010, Montenegro issued its first Eurobond, financing €200 million ($255 million) over a term of 10 years at a rate of 7.85%. As of July 2011, Montenegro was in talks with the World Bank to secure an $85 million development policy loan to support its underfunded government budget. It was expected that the World Bank would stipulate a strengthening of the supervisory role of Montenegro's central bank, a move needed in order to improve the confidence of commercial lenders and enhance the availability of traditional financing mechanisms. During the last few years, Montenegro has created a largely business-friendly investment climate. The country established the lowest corporate tax rate in the region (9%). More than 90% of capital value in Montenegrin companies had been privatized by July 2010, although there have been some setbacks to the privatization agenda. In October 2010, the government regained part ownership in a previously privatized aluminum company (the Podgorica Aluminum Plant, KAP) that had been plagued by strikes and lawsuits since its privatization. Under the agreement, the government received a 29.4% stake in the company and a 31% stake in the associated bauxite mine, as well as seats on the boards of both companies. KAP, the country's biggest single contributor to GDP, continues to struggle in the face of high resource and labor costs. The government has also attempted to privatize the state-owned airline, Montenegro Airlines, but received no bids for the portion of the company that was made available in 2010. The banking sector, telecommunications, and oil import and distribution in Montenegro are 100% privately owned. The most significant business climate improvement that Montenegro has made is in the area of tax policy. Montenegro introduced value added tax (VAT) in April 2003, and established tax rates of 17% and 7% (for tourism and staple food items) as of January 2006. The lower VAT rate for tourism is to encourage growth in this strategic industry. Montenegro also decreased the personal income tax (PIT) and implemented a 9% flat rate in January 2010. These changes have helped Montenegro rank 66th out of 183 economies in the World Bank's "Ease of Doing Business" report. There has been rapid growth in tourism and tourism investments, particularly along the Adriatic coast, in the years since independence. After a real estate boom in 2006 and 2007 during which foreign speculators purchased much Montenegrin property along the coastline, the Montenegrin real estate sector has cooled a bit. Nonetheless, the independent World Travel and Tourism Council has repeatedly ranked Montenegro as one of the top-growing tourism destinations in the world, with growth estimated at 11.9% annually through 2021. Net foreign direct investment (FDI) in 2010 reached $935.1 million, and investment per capita in Montenegro is among the highest in Europe. However, investment has slowed recently, in part as a result of the global economic crisis. According to projections of the Montenegrin Investment Promotion Agency, FDI in 2011 will range between €660 million and €730 million ($892 million and $986 million). The total value of FDI in 2011 will, to a great extent, be related to privatization projects and spatial plans that allow for greenfield investments. Compared to many of its neighbors, Montenegro has a high per capita GDP (about $10,100), though unemployment remains a problem (about 19%, according to the Statistical Office of Montenegro). The dissolution of the state union of Serbia and Montenegro in 2006 led to Montenegro's independent membership in several international financial institutions, such as the European Bank for Reconstruction and Development (EBRD) and Central European Free Trade Agreement (CEFTA), of which it was Chair-in-Office in 2009. 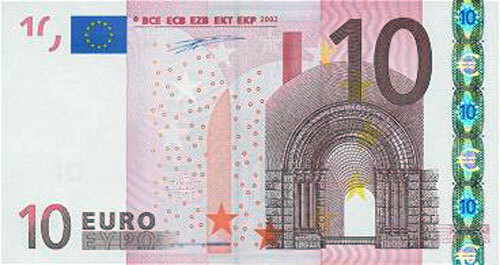 In January 2007, Montenegro joined the World Bank and International Monetary Fund (IMF). Montenegro is currently pursuing membership in the World Trade Organization. Since the 2006 declaration of independence, the European Union, Serbia, and all permanent members of the UN Security Council have recognized Montenegro. The UN General Assembly voted on June 28, 2006, to admit Montenegro as a new member state. Montenegro joined the Organization for Security and Cooperation in Europe (OSCE) on June 22, 2006, and the Council of Europe on May 11, 2007. Montenegro signed a Stabilization and Association Agreement with the EU in October 2007, concluded a World Trade Organization (WTO) bilateral agreement with the EU in April 2008, and was invited to join an Intensified Political Dialogue with NATO at the April 2008 Summit in Bucharest. NATO foreign ministers invited Montenegro to participate in the Alliance's Membership Action Plan (MAP) on December 4, 2009. On November 9, 2010, the European Commission recommended that Montenegro be approved as an EU candidate country, with the stipulation that accession negotiations begin after seven "key priorities" are addressed. That decision was ratified by the European Council, and EU candidate status was granted on December 17, 2010. As of December 19, 2009, Montenegrin citizens were permitted to travel without a visa to the Schengen area for up to 90 days per 6-month period. The United States recognized Montenegro on June 12, 2006 and formally established diplomatic relations on August 15, 2006. The U.S. maintains an Embassy in Podgorica. The overriding goal of U.S. assistance to Montenegro is to help the country transition to a prosperous, market-based democracy fully integrated into Euro-Atlantic institutions, including NATO and the European Union. The United States supports these efforts by helping Montenegro ensure stability through broad-based prosperity, building an effective security partnership, strengthening the rule of law, and reinforcing democratic institutions. Specifically, in support of Montenegro's efforts to become a NATO member, the U.S. is working to help the country enhance its border controls, institutionalize more effective law enforcement practices, and increase its military capabilities. In addition, a top U.S. priority is strengthening the rule of law and building Montenegro's capacity for combating corruption, thereby increasing public confidence in governance. U.S. assistance also seeks to strengthen the role of civil society to promote the reforms necessary for EU accession. Economic reform will also continue to play an important role in achieving U.S. goals for Montenegro. In order to further develop commercial ties between the United States and Montenegro, the first American Chamber of Commerce (AmCham Montenegro) was launched on November 19, 2008, and as part of the strategic partnership between Montenegro and State of Maryland, the U.S.-Montenegro Business Council was formally opened in Podgorica on December 16, 2008. The Montenegrin military also established a partnership with the Maine Army National Guard, and efforts are underway to broaden this relationship to include cooperation in the civilian sector. In Washington, President Vujanovic met with Secretary of State Condoleezza Rice in May 2008, and Prime Minister Djukanovic met with Vice President Joseph Biden and Secretary of State Hillary Clinton in January 2010. Deputy Secretary of State James Steinberg traveled to Podgorica in May 2009, and one congressional delegation had visited Montenegro in 2011 as of August.